This is a museum quality reproduction of a very rare Colonel pin from around 1840. It is rather large with a wingspan of 2 3/4 inches. 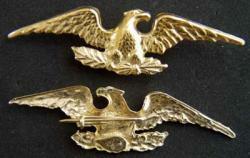 This Eagle is shown as figure 166 in American Military Insignia 1800-1851 by J Duncan Campbell and Edgar M Howell published in 1963. This would be a very rare insignia in any collection and if you collect Eagles, this would be a perfect addition to your collection. The pin is made in sterling silver with a 24k gold plate. As was the custom they only wore one insignia.